This blog is not dead and I can prove it. Just last week I was out in the field digging up the remains of old movie theaters which will be written up into drivulous little essays in due time. At this point I've got a backlog of material dating to 2015, October, which I've neglected to get around to for one reason or another. Actually, the reasons are two fold. One, as I stand awkwardly on the doorstep of middle age, I've begun to care a bit more about my personal finances. Meaning I'd like to have some to speak of. 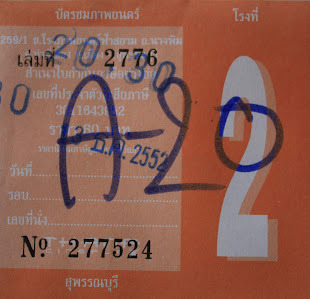 The second and more pressing reason is that what's left of my creative juices are being squeezed out into a book on Thailand's movie theater. 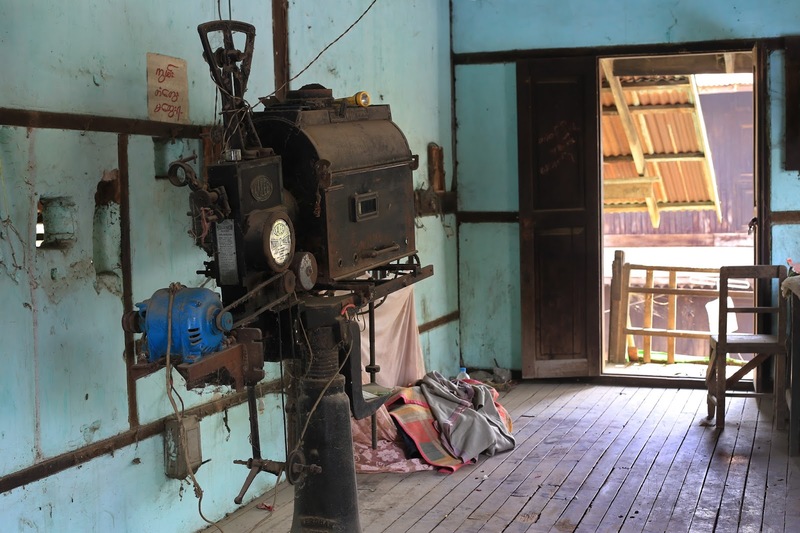 In fact, it's called just that: "Thailand's Movie Theaters: relics, ruin and the romance of escape." After many delays and restarts, there is finally light at the end of the tunnel. Writing for a book, unlike writing for a piss-ant personal blog like this, is no easy feat. Not for a mediocre like me, anyhow. So rather than squander my creativity on senseless blog posts, I've been rerouting them to said book. Again, no easy task. But in the name of keeping the SEAMTP faithful happy (if any of you still exist), here is a mini-post to prove, once and for all, that I still love doing this work, and that as long as there's a few people out there willing to read what I write and look at my pictures, I'll fulfill my end of the non-existent social contract we don't have between us. Welcome to carbon monoxide corner. 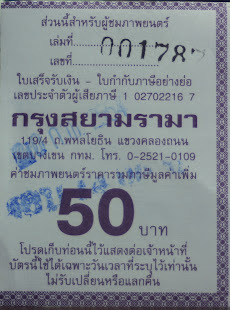 Better known as Rangsit. 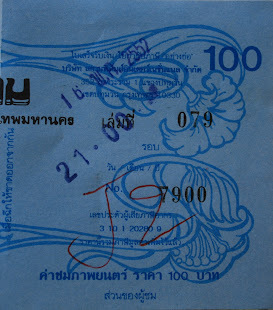 Thailand's tailpipe. The most charmless blotch of civilization ever. Within this context of ten-lane, at-grade highways and sub-brutalist retail blocks - completely devoid of plant life - stands an equally charmless stand-alone movie theater. 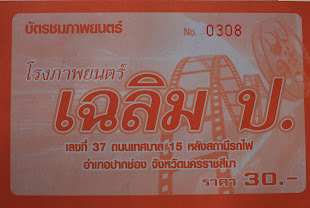 Say hello to the Petch Rangsit Theater. In its current condition, it's the type of place where street dogs go to die, but not before defecating in it while they're living. Whatever type of grace-saving signage this building once had has been removed, leaving a featureless concrete box covered in soot and tropical mold. 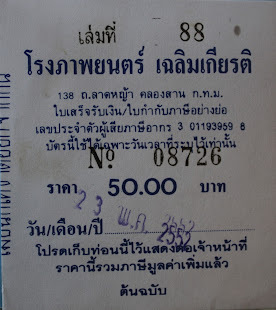 Rangsit was apparently once a relatively charming Bangkok hinterland. 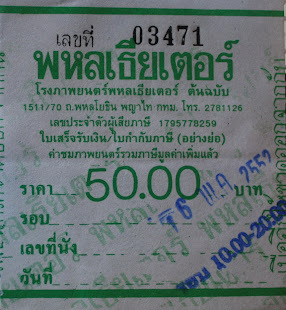 An agriculturally productive area highlighted by the eponymous Rangsit Canal. When built, the canal was one of those key infrastructure projects that solidifies a place's economic clout. 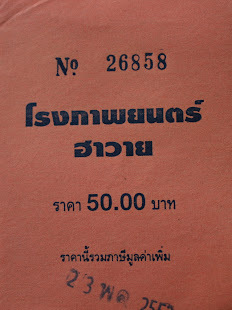 After completion in the early 1900's, the canal helped further centralize Bangkok as the nation's commercial hub by connecting the Chao Phraya River with the Nakorn Nayok River and opening up huge swaths of land to agricultural production. 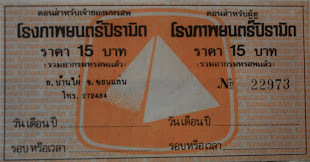 The canal made Rangsit into a junction from the beginning. 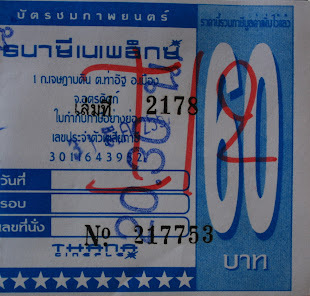 But since the arrival of the highway system, Rangsit has been transformed into one of the country's biggest transit corridors, hence the pollution and general lack of charm. By the looks of it, The Petch Rangsit Theater was built in the early 1980's, part of the larger commercial quarter described in not-so-glowing terms above. An edge city development predicated on cars and buses from the get go. 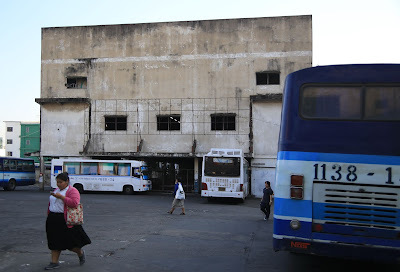 The lot in front of the theater, in fact, is now a local bus terminus, which indicates that the theater was built to capture that transitory population. 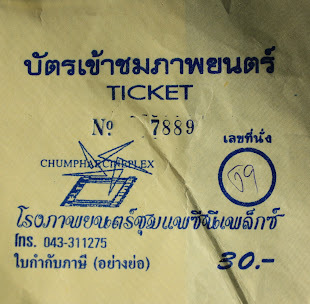 In its working days, the Petch Rangsit was a second run theater that was routinely programmed with triple features, a business model which fits the come-and-go needs of a transient clientele. 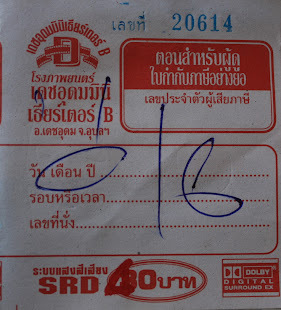 Of the several thousand people that pass it on a daily basis en route to or from Bangkok and points beyond, very few likely have an inkling of what it was, or that it once made this slice of automotive hell a little bit better. 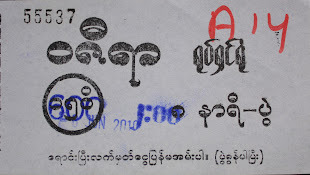 Letpadan had not been on my radar until early 2016, when, while at a photo exhibition in Yangon, I saw some shots of university students clashing with police there from the year before. Those images were the first I'd heard of the town, leaving me with an impression of a contentious little place full of disaffected youth and brutish cops. 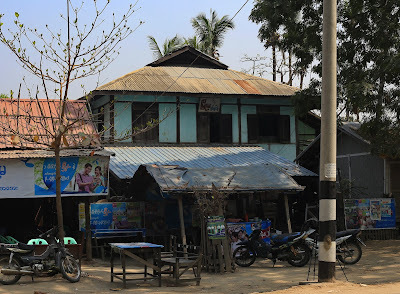 Later on, a few older Myanmar friends mentioned that Letpadan was once a fairly important trading center, if not the primary town of Myay Latt - Myanmar's version of the English Midlands - an agriculturally rich area running northwest from Yangon up to the lower Dry Zone. Any place with that kind of clout, I reasoned, was bound to have had some movie theaters. Those suspicions were confirmed during last February's "Theater Hunt." 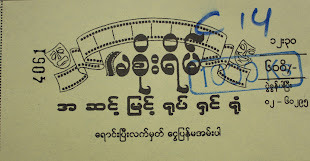 Ledpadan is indeed home to two old movie theaters - The Myoma and Aung Mingala cinemas. Both share a similar architectural footprint and stand directly next to each other just off of the city's main traffic circle. Together they comprise what must have once been the commercial center of the town, with their broadside girth dominating the the low rise townscape. The Myoma Cinema stands in the background on the left. 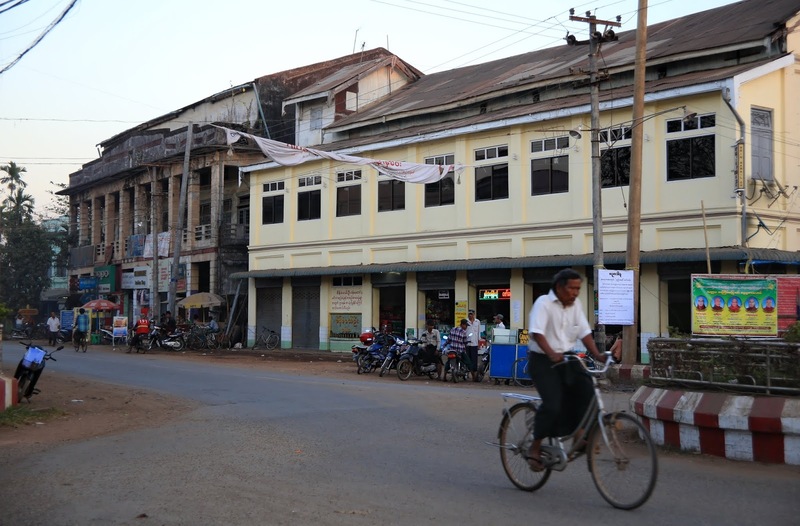 The freshly painted Aung Mingala Cinema stands on the right. From the exterior, The Myoma Cinema has the appearance of a brick and mortar dignitary with a skin condition. One that could be easily remedied with a scrubbing and fresh coat of paint. 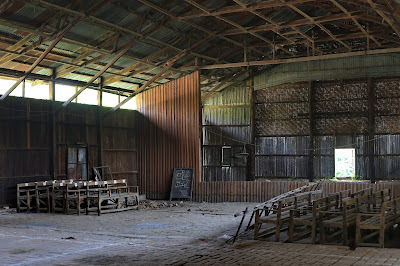 Nevertheless, The Myoma radiates an old-school charm despite its crumbly worn facade. The theater itself, which was located on the second and third stories of the building, has been closed for over a decade. But the shops that occupy the ground level portion of the structure, each situated in its on little nook behind the arcades, make the dormant theater lively even in its under-utilized state. 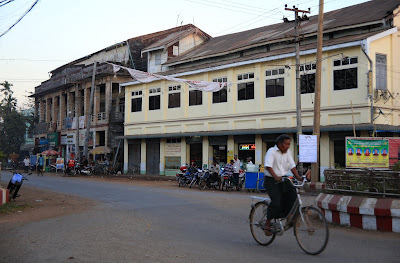 The Myoma Cinema, dating to 1959, one of the more interesting buildings in Letpadan. In an offhand way, The Myoma and other similarly designed movie theaters were the forerunners to the contemporary multiplex-shopping mall combo that make so much of urban Southeast Asia into an air-conditioned nightmare today. Retail space on the lower levels, movie theater on the top. Sadly, the new architecture of convenience tends to lack the human scale charms present in buildings like The Myoma, which are slowly being lost across the region with each passing year. I can only image the time capsule of an auditorium, with its wood-worked balcony and hand-crafted ornamentation, all boarded up on that second level, but nobody seemed to have the key for it. 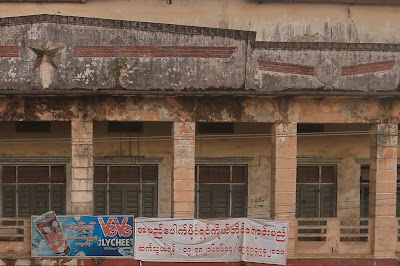 Lucky for me, the Aung Mingala Cinema next door had a well preserved second level, which I was kindly granted permission to photograph and has an auditorium which I would guess approximates the Myoma's. Guess you'll just have to wait for the next post to see. Welcome to the "midlands" of Myanmar. Myay Latt, as the locals call it. This verdant section of the country spans the immediate northwest of Yangon, following the Yangon-Pyay train line up to its terminus in Pyay. 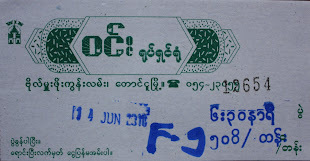 Dotting the railroad, between emerald paddy fields and patches of scruffy forest, are a series of typical Myanmar towns. Low-rise, low-tech, quaint and human scaled. Products, mostly, of said British colonial-built railroad and the mercantile economy it spawned. Welcome to Thonze, my first stop along the midlands trail after an early morning departure from Yangon. It was February 5th, which is noteworthy only because back in America it was the evening of the 4th and my hometown Philadelphia Eagles were playing the New England Patriots in the Superbowl. Philly is famous for its losing sports teams, so when any of them make it to the championship, I take note, no matter where I am. It's a simple matter of culture, what little of it we possess. The bus pulled to the side of road so myself and a young Myanmar couple could squeeze out. 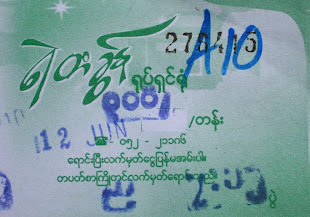 Like most local buses in Myanmar, this one was packed to the gills with passengers and their baggage. Disembarking required a contortion act involving a bit of rolling and snaking. After I had collected myself I reached for my phone to check the Superbowl score. Victory Eagles! I was overcome with a nebulous pride over this fickle civic achievement, followed by a brief desire to be among my friends and family, drunk, joyously celebrating in the Philadelphia cold. But as quickly as it had come, the feeling faded, as I turned to more immediate concerns. "Hello my brother," I said to a middle aged man on the street. "Does Thonze have an old movie theater?" "Yes," he said, pointing in the direction I could find it. In a sense, it's more the typology and placement of the stand-alone variety of movie theater that interests me than anything else. Architecture, while always important, is secondary to how the theater interfaces with the town itself. The Yadana Win Cinema wasn't exactly what I would consider a stellar find aesthetically. From the looks of it, I guessed it was a relatively recent build, maybe dating only from the 1980's or so. There was nobody around who could let me inside, nor anybody in the vicinity with a good enough command of English to impart me with a Yadana Win history lesson. So I decided that I would be satisfied with a few exterior shots and move on. As I was taking aim at the theater, offhandedly wishing that I was back in Philadelphia reveling a Superbowl victory, I started to notice something strange. 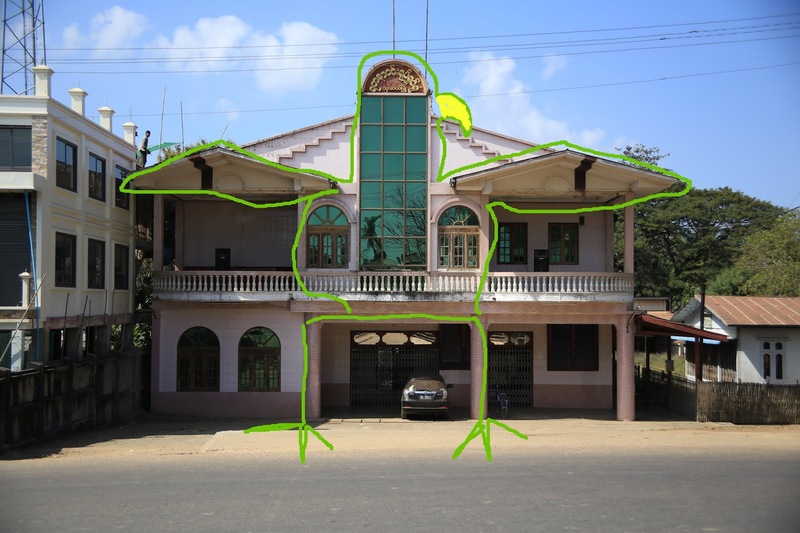 The Yadana Win Cinema started to vaguely take on the appearance of a bird. The awnings above the windows had a striking resemblance to avian wings. The pillars were like legs. The ugly glass panels up the center of the building reminded me of a bird's neck. And with a little imagination, the peak of the cornice was like a bird's head. Adding to the weird coincidence that you might, by now, be starting to piece together, is the theater's name. 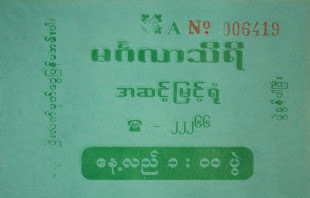 Yadana in Burmese has to do with royalty. Win is simply a common name. But in English we all know what win means. Think about it for a moment! The Royal Win Cinema; the Superbowl champion Eagles; a theater with a bird-like visage; a wayward Philadelphian looking for movie theaters. Does anybody else see the bird? If there's a god above, it's one cryptic mother. (Disclaimer: to be honest, I could really care less about football, professional or otherwise, but particularly so in the wake the NFL's announcement that it would fine players for taking part in non-violent protests, such as kneeling during the National Anthem). Putting aside reports of ethnic cleansing going on in Rakhine State and the many unfulfilled political expectations, Myanmar as a whole has received glowing press coverage over the past several years. The super charged economy pegged to government reform, blossoming democracy and a budding arts and culture scene have made for many a fancy read about Southeast Asia's "final frontier." That's all good. It's a fascinating country, after all, and I couldn't recommend a more worthwhile place to visit. But there is an egregious downside to the progress being made that isn't getting nearly as much attention as it deserves. The unsustainable growth in the use of cars. 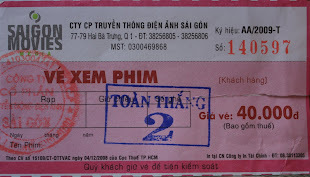 In 2010 when I first visited the city, yeah, there were cars. There was even traffic jams. But now it's terrible. So terrible that the quality of public life has declined collectively so everyone can enjoy their own private ride in a car. Does that equation make sense? The total quality of life for all has plummeted, so that for the individual passenger in a car it can improve. It's a weird zero sum equation if you ask me. I know, I know. High traffic volume is an indicator of prosperity. A sign of progress. Please! Spare me the apologist sentiments for this pathetic century-plus lifestyle trend. Yangon's charm is being choked out by the car. The municipal government chopped the sidewalks in half to increase the parking capacity. In the process they've kicked vendors who earned a living on those sidewalks off of them. All the quiet little side streets - the numerical streets - have become jammed with cars. It's really a pathetic scene. Anybody who tells you otherwise is clearly in love with their car-centric lifestyle. 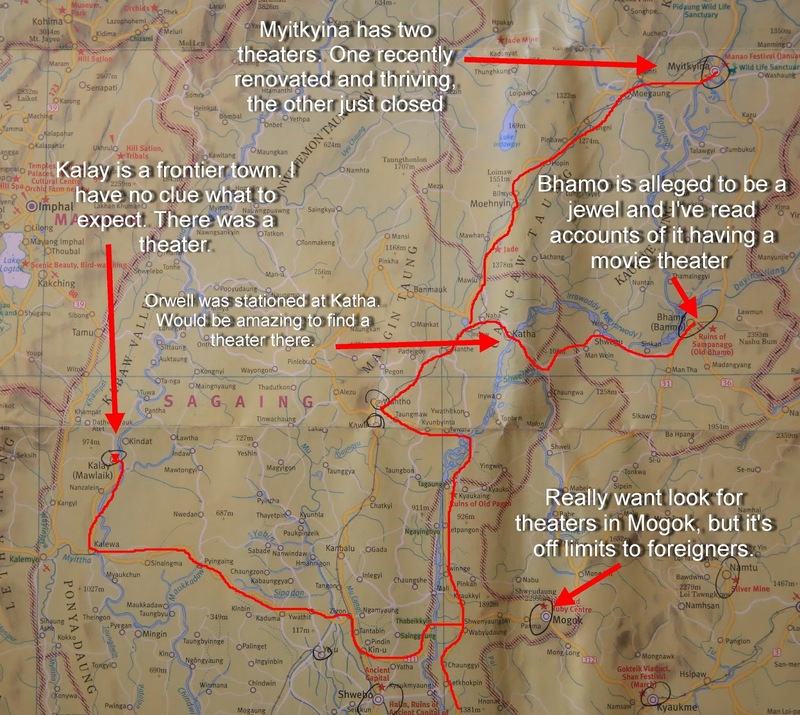 Now that I've finished my rant, here's a little story about my trip to the South Okkalapa neighborhood to visit The Padaythar Cinema. I arrived there by taxi. The Okkalapa's, both north and south, were essentially massive public housing projects. 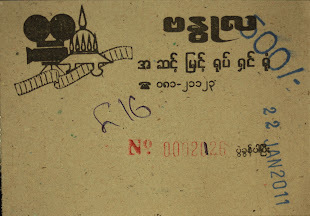 Their geneses began in the wake of the post-World War Two civil and ethnic conflicts that rocked newly independent Burma. Refugees fleeing the fighting poured into Yangon. The government responded by extending the city grid to the north and east, and filling it in with housing. 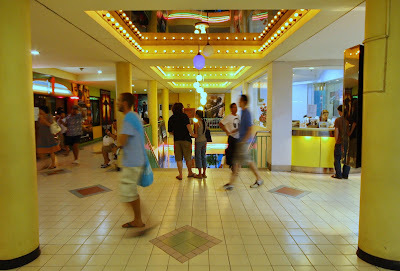 A few movie theaters were built in the early 1960's to provide some much needed escape for the newly minted urbanites. Among them was The Padaythar. The Padaythar Cinema stands in the middle of an overgrown field, gated off from the otherwise crowded South Okkalapa neighborhood. Cinema ruin in an overgrown field. Nice foliage conveniently blocking my facade view. 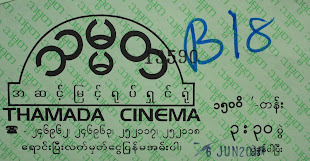 My cabby had a vague recollection of a neighborhood cinema tucked away somewhere in the middle of South Okkalapa. 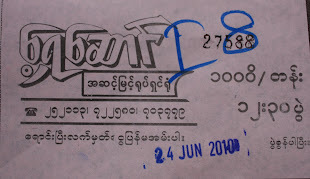 It's been at least 10 years since the Padaythar closed down; plenty of time for it to fade from memory. He stopped on few occasions to ask directions from various street hawkers and pedicab drivers until we found our way there. The midday sun was reddening my neck as I pushed open the shoulder-high chain link fence surrounding the cinema grounds. I walked across a dirt tract with what seemed to me like swagger, but I probably looked like a mad man. 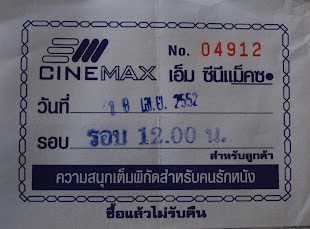 No more than 10 steps in and I was spotted by a rent-a-cop lazing in front of fan in the shade of the theater's veranda. He tried to wave me off, but I quickly turned the tables on him, beckoning him near as I strode purposefully towards the abandoned theater he guarded. As we neared each other, I slowly raised my SLR from its bag and, with the other hand, extended a finger towards yonder ruin. 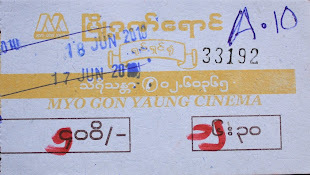 "I photograph movie theaters," I blurted in crummy Burmese. He shooed me off again, but I held tight, repeating my original phrase and adding "I like movie theaters very much," in earnest. For my next gesture, I indicated with the flick of my hand that I only intended to shoot the exterior. With that he was convinced. Over the next ten or so minutes I made the photos that you see above. Interior shots were strictly forbidden. 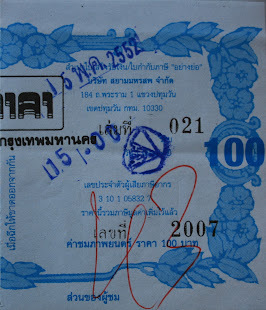 When I had completed my work I thanked the guard, exited the theater grounds and haled a taxi back into town. This movie is a real tear-jerker sans the Hollywood ending. For those that take pleasure - if not refuge - in vintage movie theaters, it's essentially a tragedy. 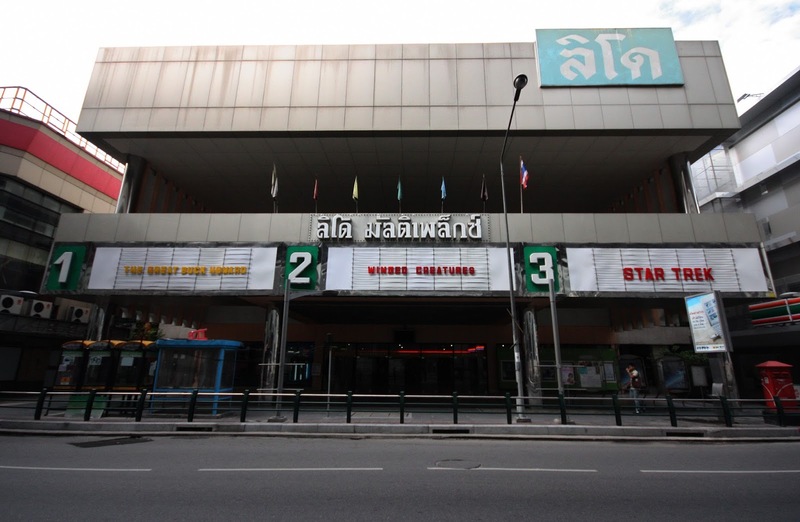 The story comes to a tragic finale with The Lido Theatre, one of Bangkok's foremost cinema institutions of the past 50 years, closing down at the end of May. All indicators point to a complete overhaul of the vintage movie theater. If it's not torn down altogether, it will be remodeled into yet another shopping center. 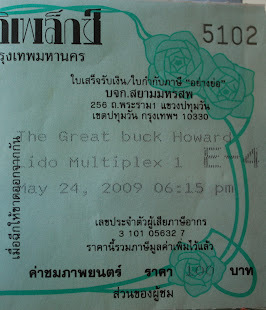 The way I see it, the loss of The Lido Theater is akin to performing a minor lobotomy on Bangkok. With so few places left to watch a movie on the big screen that doesn't involve a trip to a shopping mall, the Lido's demise will cut particularly deep. 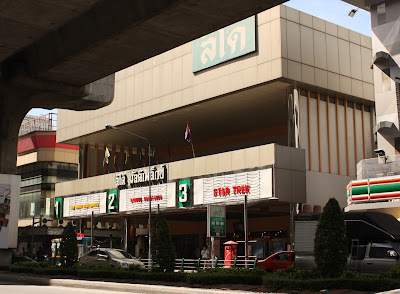 True, there are a handful of newer theaters (House RCA, The Friese-Green Club, Bangkok Screening Room and Cinema Oasis) that do a stand-up job of bringing unique programming to the city, but none of them are housed in a purpose-built, mid-century movie theater. There is something to be said for that. 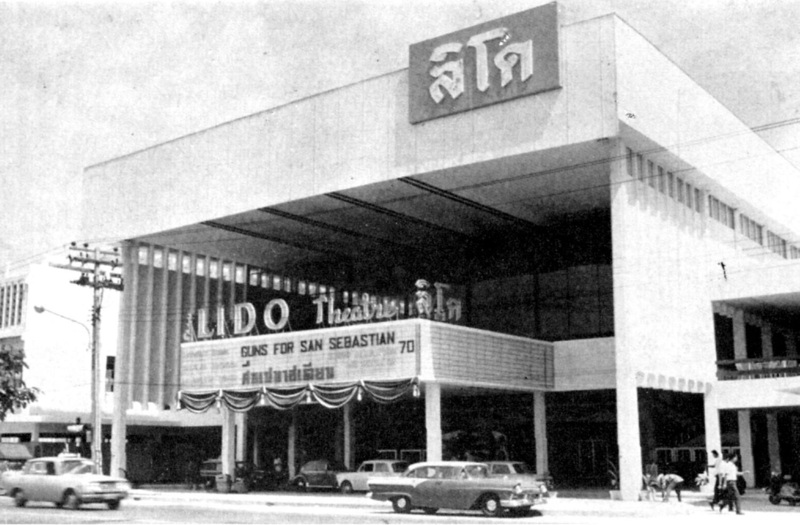 When The Lido Theatre first opened its doors on June 27th, 1968, the Siam Square neighborhood it stands in saw its inventory of sleek, modern movie palaces double over night. 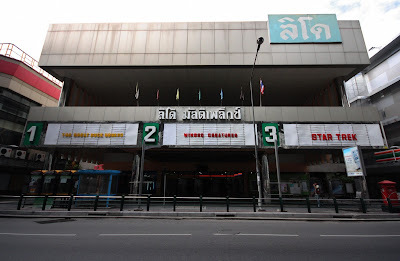 The two-year older Siam Theatre, which stood about 100 meters away, had initiated the neighborhood's transformation from a peri-urban slum into Bangkok's main commercial hub. 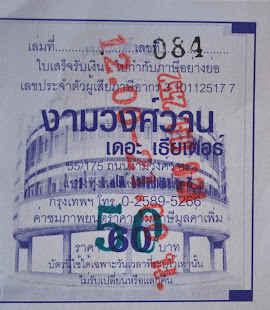 With The Lido, the area was further solidified into one of Bangkok's most vital shopping zones. 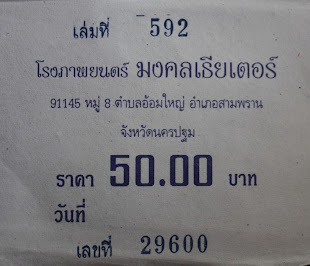 For a bit of historical context, Bangkok of 1968 was a city in the midst of a development frenzy brought on, in large part, by Thailand's Cold War partnership with The United States, which targeted the country as mainland Southeast Asia's bulwark against the spread of communism. As a result, Thailand and its succession of military governments were showered with economic development assistance, supercharging the market economy in the process. 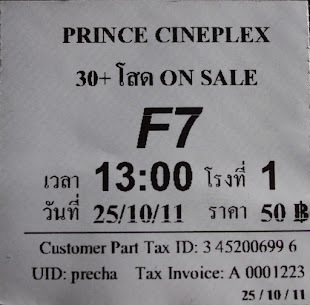 Suffice to say movies and movie theaters played a critical public relations role in making Thailand one with free-market capitalist values. 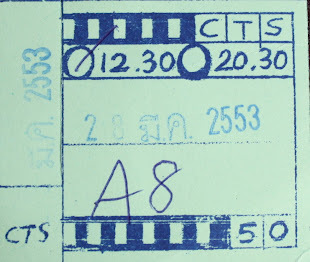 For a time, the Thailand rep for the Motion Picture Association of America was an active CIA agent, helping to ensure that the Hollywood movies screened in Thai theaters had a definitively pro-capitalist, pro-Western bias. The Lido chugged along through the 1970's and 80's, steadily providing a first-class cinema experience for Bangkok's cinephiles. 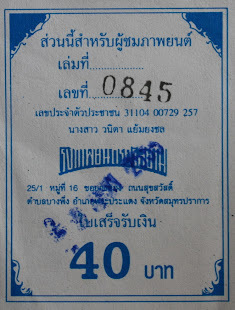 In 1992 The Lido was damaged by a fire, but instead of using that as a pretext to divest itself of the aging theater, Apex, the parent company of the Lido, Siam and Scala, reopened it a year or so later as a three-screen multiplex. For many Lido faithful of today, that's the only form in which it's ever been known. 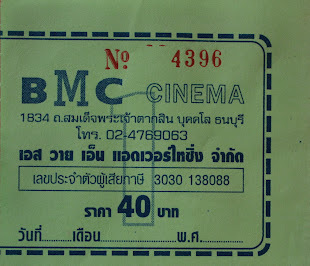 By the dawn of the new century, Bangkok was fast becoming a crowded movie theater market. While most of the city's stock of ageing stand-alone theaters was on the wane, a new generation of multiplex theaters were cropping up in shopping malls across the city. With them came the all-in-one convenience of shopping, eating, free parking and multiple films to choose from all under one high-tech, low-brow, climate controlled roof. 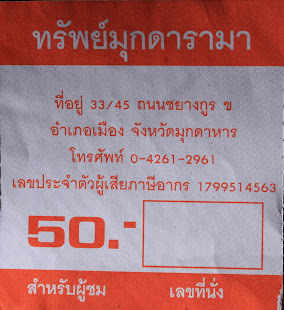 Malls caught on like wild fire among Bangkokians. For some, they became the new symbolic standard for middle-class consumerism. Meanwhile, The Lido and its Siam Square siblings held tight, ramping up their specialized viewing fare as means of staying relevant. Checking out the viewing fare in front of The Lido. To say anything of The Lido without giving credit to Apex Theaters and the company's steadfast if taciturn owner, Nanta Tansacha, wouldn't be fair. Ms. Tansacha and her siblings inherited the cinema business from their late father, Pisit Tansacha, who despite his untimely death nearly fifty years prior, built the Apex brand into the largest theater chain in the country. He also became one of the wealthiest men in town in the process. The Lido was never an architectural masterpiece. But that's part of its charm. Simple, down home, no frills cinema experience. 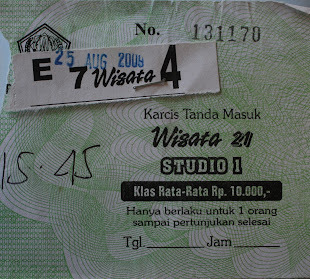 Indeed, when Nanta and her brothers took over, the Apex theater empire was in full swing. 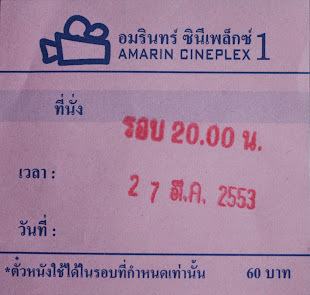 But the mushrooming of mall-bound multiplexes across Bangkok in the 1990's and 2000's would soon cut deeply into Apex's market share. 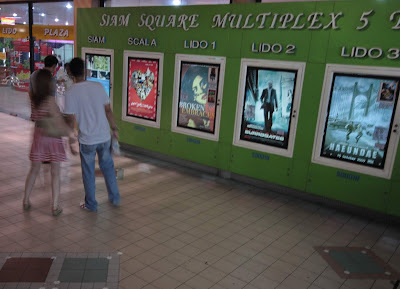 Slowly but surely, the company divested itself of some of it's most beloved theaters until their chain was whittled down to the aforementioned Siam Square Three (two, after The Siam was destroyed in a 2010 fire). Beginning in the aughts, movie screenings with a single patron became commonplace at the Apex theaters. Yet Nanta and her loyal Apex staff persevered. At the end of last December, that reliable perseverance ran out. 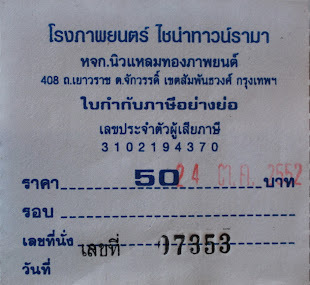 Chulalongkorn University, landlord of Scala, Lido and the rest of Siam Square, announced that Apex would not be renewing their leases. The outcry that followed was intense. An ad hoc "save the Scala" campaign erupted across social and mainstream media, highlighted by a #savescala hashtag. So fevered became the pitch that the Office of Property Management at Chulalongkorn University made it clear that Scala would not be harmed in any way. While The Scala was being fussed over, plans to close and The Lido were being finalized. And so it is, in just a week's time old faithful Lido will be no more. I once ran into Ms. Tansacha in the lobby of The Scala. Cornered her, really, just as she was about to leave. She's a tall, elegant woman; clearly a beauty in her younger years. I introduced myself as the schmo who had written the article for The Bangkok Post, "The Case for Preserving Scala and Lido." She knew the article, and much to my surprise stood there talking with me for nearly an hour. I missed the movie I was going to see on account of it. The main reason that she kept The Lido and Scala up and running all these years, despite the diminishing returns, costly upkeep and general burden of it all is because it's family. The employees, the regulars, they're like family. You can't turn your back on your family. 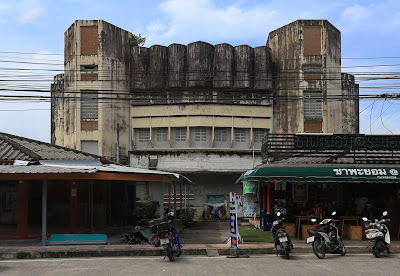 At the end of this month, Bangkok will lose a treasured cultural institution, beloved cinema hall and one of the last great family enterprises left in Thailand when The Lido Theater closes its doors. There are two noteworthy sights on Sule Pagoda Road, Upper Block. 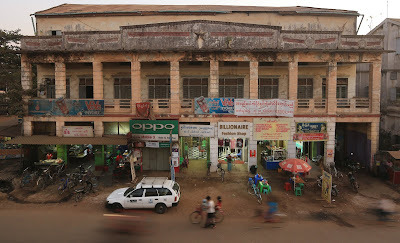 The Nay Pyi Daw and Shae Saung cinemas.This duo of "Burmese Polychrome Theaters," both tidily maintained by Mingalar Cinemas, are the last vintage structures left on one of the most high profile blocks in the country. 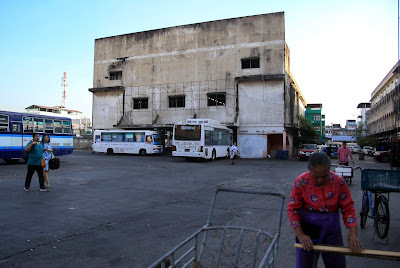 All other old buildings, including two more cinemas that once stood across the street, have been pulled down, bit by bit, over the past 20 years. One might assume that the charming old stock of buildings that used to line this gateway thoroughfare were demolished to make way for new ones that reflect Myanmar's bright new demeanor since entering the world stage. Think again. Not a single one of the buildings which has replaced the old stock is worth a second look. Functional mediocrity, at best. Too bad collective confidence doesn't necessarily make cities look good. 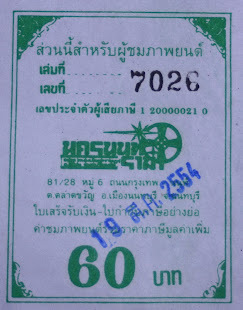 The Shae Saung Cinema, however, does look good. At least I think so. It and its sister theater - The Nay Pyi Daw - up the street are two beacons of the cityscape from a time when movie theaters were the proverbial living rooms of the city, and reflected that important social role in their architecture. 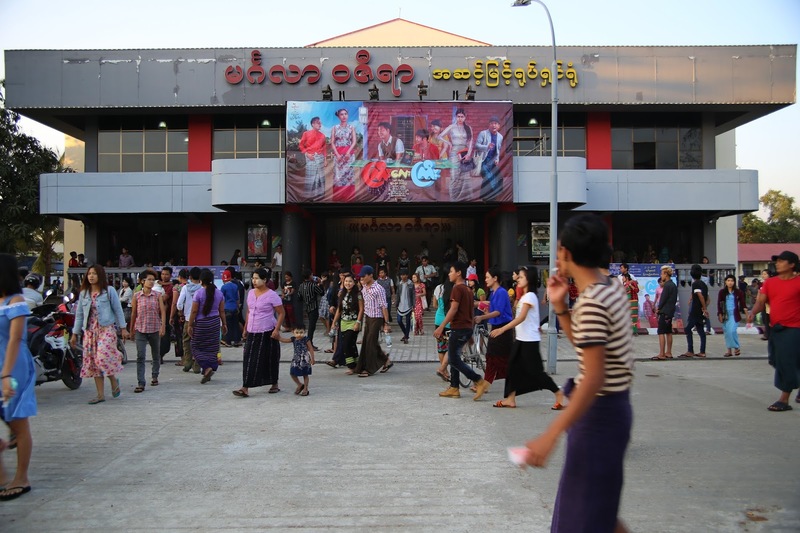 Many a visitor to Yangon have remarked about the two colorful movie theaters accentuating the block. Place makers in the truest sense. Street vendors in front of the Shae Saung provide cheap snacks to movie-goers while enliven the street. Crowds shuffle in at Stall level seating. A ticket taker stands by the door. 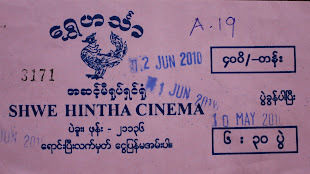 During past visits to The Shae Saung, as well as other Mingalar operated cinemas, I was never able to get past the front door. If I did it was only to slouch down in a seat for a movie. Facades were the most I could hope to document. 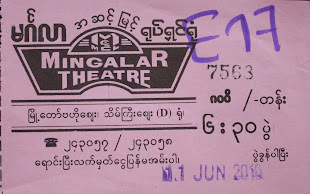 Over the past two years, however, Mingalar and me have gotten familiar (the theater chain sponsored my most recent Myanmar theater survey). These days instead of swift dismissals by theater security, I get the red carpet treatment from theater managers and the privilege of full access to Mingalar's entire fleet of mid-century movie palaces. A golden ticket in the hyper-niche world of movie theater photography. Here's a few shots of the auditorium I took between screenings. 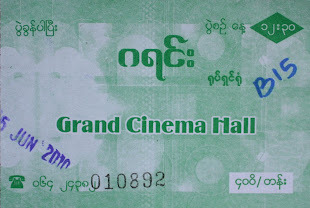 The Shae Saung has over 600 seats, making it one of the largest movie theaters in Myanmar. Comfort and luxury are trademarks of Mingalar Cinemas. The Shae Saung is no exception. 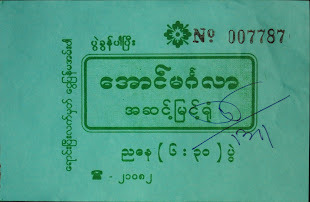 Most theaters in Myanmar built prior to the Ne Win coup had English names, indicative of the country's past status as a colony of England. 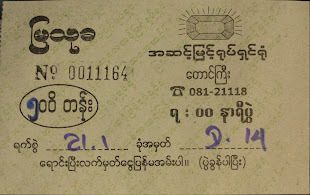 Soon after Ne Win took over, a policy was hatched that forced name changes from English to Burmese in a bid to restore a sense of dignity to the nation. Shae Saung translates to "Pioneer," but the cinema's original English name was "The Light House." In this age of cut-rate architecture the name Light House seems more appropriate now than ever before. 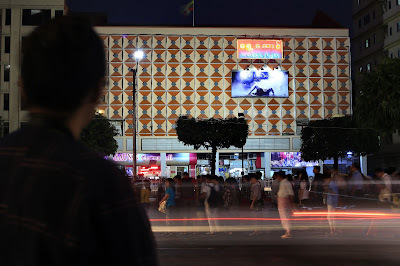 The Shae Saung Cinema is a beacon, a light house if you will, signaling a time when architectural design was not the domain of developers but of artists. Even if it's not your cup of tea aesthetically, it's hard to deny the artful design and its keystone role in the life of this once elegant block. 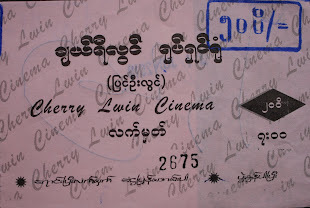 It would take nothing short of a military dictatorship feigning benevolence to erect a movie theater like the Waziya 2 Cinema up in Hlaingthaya Township on the outskirts of Yangon. I don't mean that cynically. 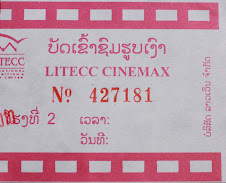 Back in the early 1990's, no bottom-line minded private theater operator would have had the gumption to plop a massive movie hall in the middle of a rice field in the sticks. Stuff like that only happens when turning a profit is as easy as stealing the wealth of a nation. 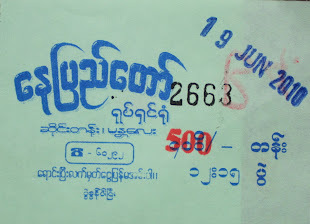 Indeed, the kleptocrats behind the Than Shwe government went through a mysterious period of theater construction in the early to mid 1990's. 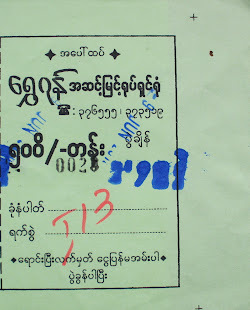 At least 3 that I know of were built in Yangon, a few in Mandalay and others elsewhere, too. 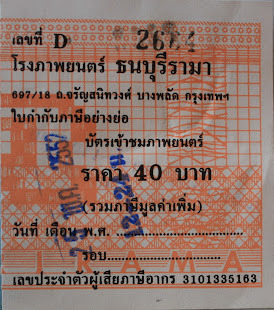 It may have simply been part of a wider infrastructure development initiative that the generals put in motion in the aftermath of the 1988 pro-democracy crackdown. Placate the citizenry with new roads, bridges, ports and why not a movie theater or two? What better way to make them forget how much they hate you? Whatever logic lay behind this act of generosity, its legacy is a block of hulking concrete with a movie screen in it. Not an architectural beauty by any stretch, but looking at it, it's hard not to indulge in a little dystopian fantasy. You can just about feel big brother's cold, pan-optical gaze leering down at you from this cement cinema hall. Personal freedoms swapped for failed cradle-to-grave security and some propaganda films. Reality surrendered. That's more the Soviet version than the Burmese Road to Socialism, but the look is the same. That was then, of course, and this is now. A brave new Burma is upon us, no longer fettered to the whims of dictators. Capitalism and the whims of the market have taken their place, and movie theaters are reverting to private ownership. Enter Mingalar Cinemas. 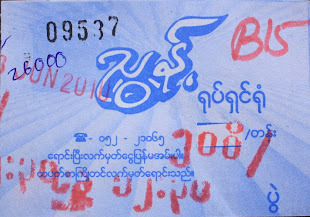 The Yangon-based theater chain - Myanmar's largest - acquired the Waziya 2 in 2015 following a two year spell of sitting dormant. The new owners sank some money into it, sprucing it up enough to mute the authoritarian look and adding some much needed pizzazz. 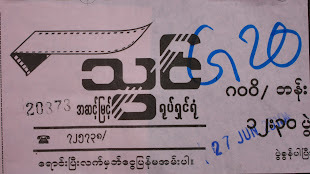 They dropped the "2" from the title (Waziya "1" being a Beaux Arts beauty from the 1920's in downtown Yangon) and prefixed "Waziya" with the company name. "At first we thought we would divide the single-screen auditorium into three smaller ones," a company rep told me, "but in the end we opted to keep it as one to accommodate larger crowds." 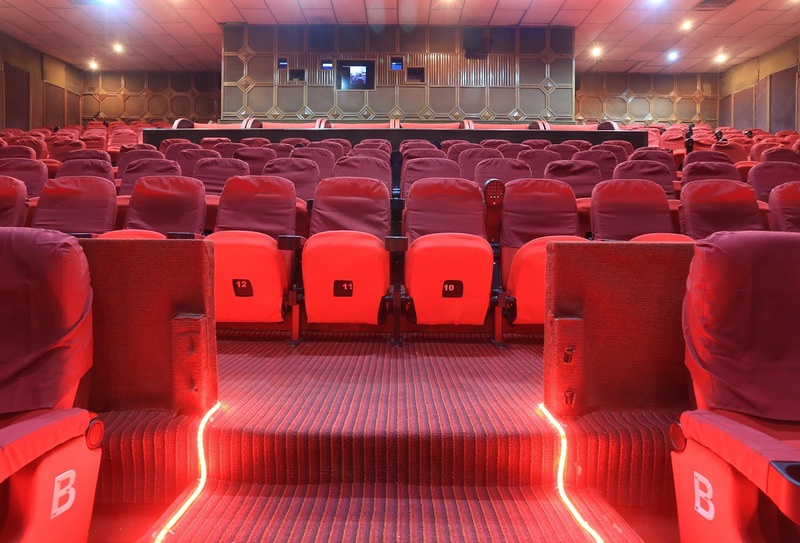 Since installing top-of-the-line Christie 4K Digital Projectors and Dolby Digital Sound, the new and improved Mingalar Waziya Cinema is doing better than ever. "It's a good thing we kept the auditorium whole," mused the representative. "On weekends the theater is usually packed." Crowds pour out of late afternoon Sunday screening at the Mingalar Waziya Cinema. Packed house weekends are no exaggeration. I arrived on a late Sunday afternoon just in time for a screening to let out. A Burmese romantic comedy judging by the billboard. As I surveyed the grounds for prime angles to shoot, the theater's doors opened and a trickle of people sauntered out. Moments later the trickle turned into a deluge, as seemingly satisfied movie-goers poured out into the surrounding lot towards their bicycles, motorbikes and idling taxis parked outside the gates. It was a beautiful sight to behold. The good old fashioned collective pleasure of the cinema, sacrosanct in its concrete stand-alone guise, in full swing. If tickets for all 651 seats weren't sold then it was pretty close. A quartet of movie-goers go to the movies. 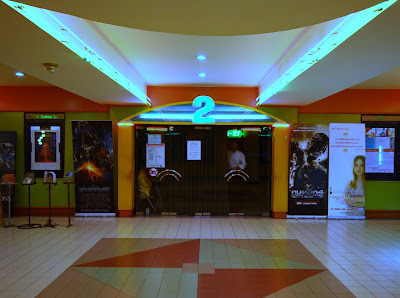 The side entrance of the Mingalar Waziya is where the box office and lobby are. Staff at the Mingalar Waziya cleans up the theater between shows. Now, I don't know this for certain, but by the looks of it most of Hlaingthayar Township was probably agricultural in the 1990's when the Waziya 2, as it was originally called, was built. Most of the nearby structures look tellingly recent. Others are little more than slapdash huts by the side of the road and other developments on the fly. Between the two are tracts of fallow rice fields. 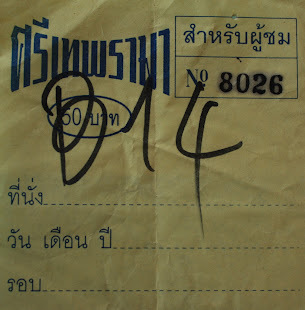 Nowadays, Hlaingthaya is thick with industry. 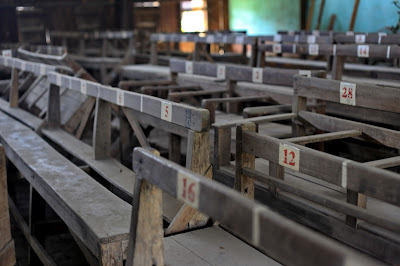 Young factory workers and their families comprise the majority of residents, who in turn make up the bulk of the audience at the Mingalar Waziya. Prescient planning by the military gov. 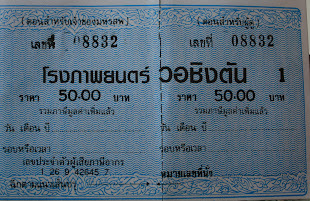 to plop a movie theater in a rice paddy that would soon be zoned industrial, densely populated and in need of leisure activities. And a wise move on the part of Mingalar Cinemas to buy it up, slap their brand on it and keep it intact. 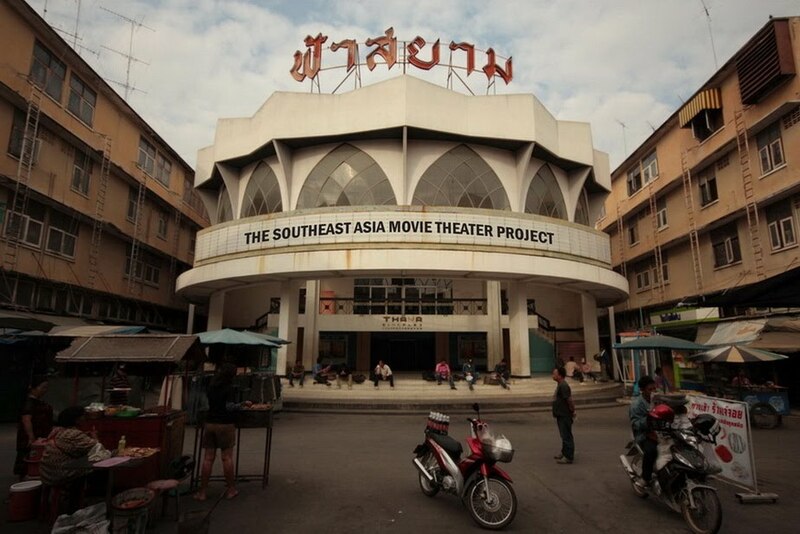 For those of you who only follow The Southeast Asia Movie Theater Project blog and don't follow my Twitter, Instagram or Facebook feeds, you might not be aware that I'm in the midst of a crowdfunding campaign. The aim of the campaign is to raise funds for a feature length documentary about my work photographing old theaters in Thailand and Myanmar. Details of the campaign can be found by clicking here. If you like the work I do, please consider chipping in. 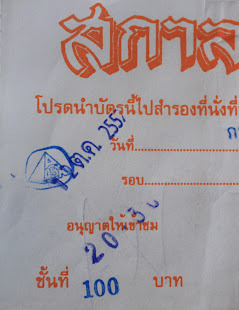 Even the smallest donation (200 Thai Baht, or $7 US in this case) helps. The trip was grueling. In 23 days, 27 towns were visited. Some for no more than a few minutes. Or just long enough to learn that there were no theaters left to shoot. Of all the predictions listed in my pre-departure post only a handful occurred. No run ins with raging ethno-nationalists, thankfully, nor any skin contact with scalding tailpipes. I was sidelined by a case of the green-apple quickstep for a spell, but it couldn't have come at a more convenient time. Namely, while sucking up the largess of my old alma mater at a comfortable Mandalay hotel. 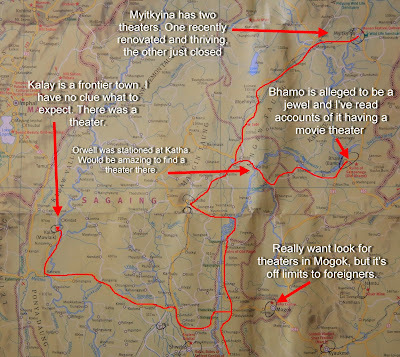 The theater tally has yet to be tallied, but I suspect it's somewhere in the range of 27 theaters, give or take. A few were repeats. Most were never before seen. Among the batch are some outright gems. Hopefully my photography will do them justice. As I sort, edit and delete my way through this batch of images, the 2018 Myanmar Theater Survey motherload, I leave you with a preview of things to come. 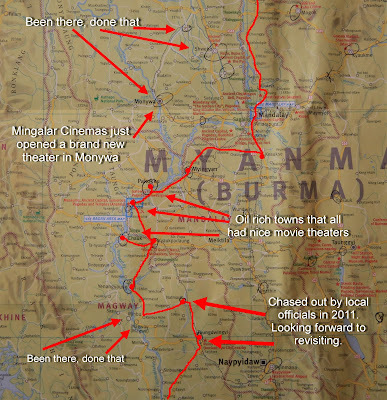 For the third consecutive year, ye olde Myanmar map will be put to good use. 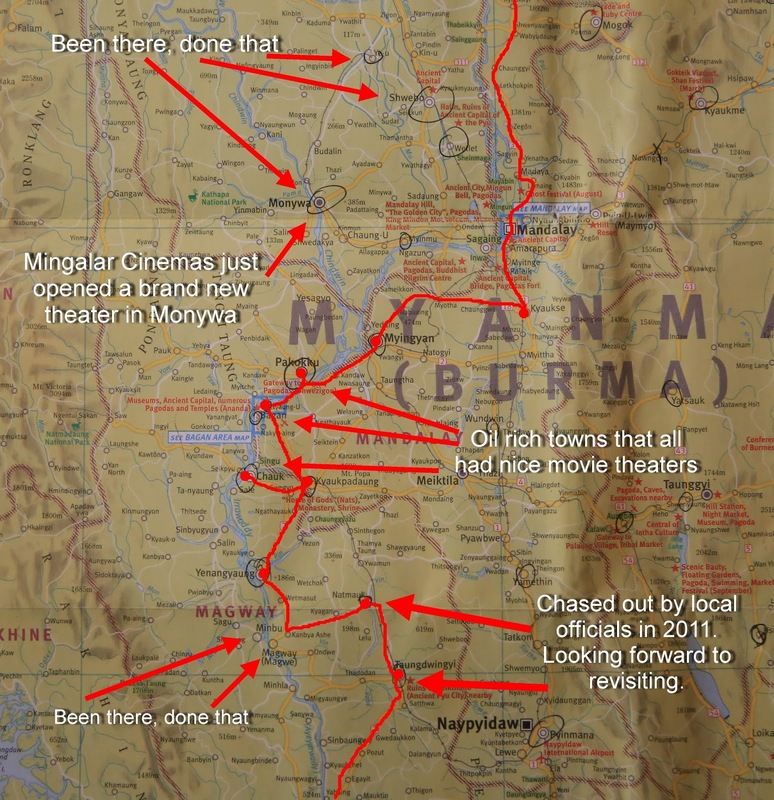 From my starting line in Yangon, I plan on moving in a northwesterly direction up through Western Bago and then zig-zag my way across Magwe, Mandalay and Sagaing Regions. 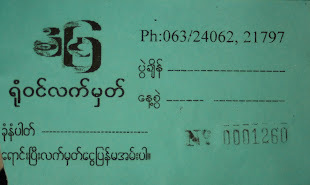 Barring any holdups, the survey should end in either Myitkyina, Bhamo or Kalay before heading back down to Yangon by the 21st of February. I will try to squeeze in as many towns and their respective movie theaters as possible in a northerly race against a three-week time limit. First stretch of the theater hunt. If all goes as planned I will get severely ill - possibly from food poisoning - lose some weight I can ill afford to lose, and maybe suffer a burn or two during this expedition. I will get diarrhea. Dehydration will get me once or twice. I will vomit. 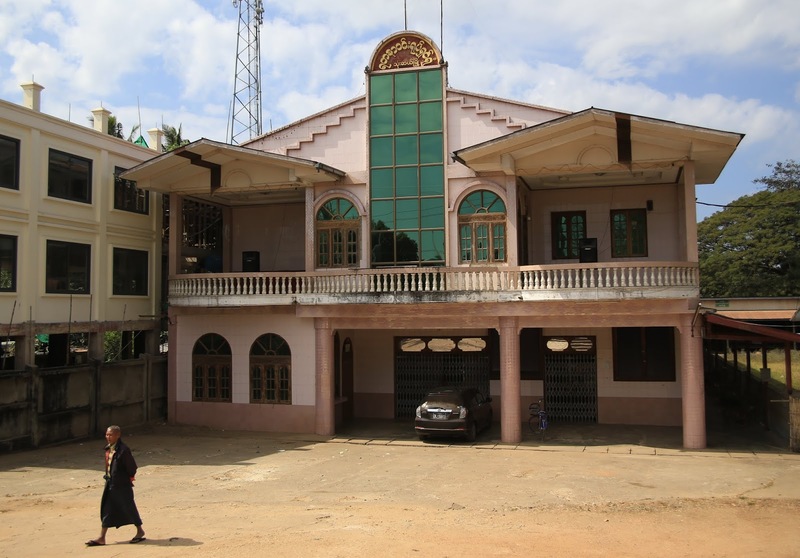 The civilian informants and local gendarmes who chased me out of Natmauk - General Aung San's birthplace - and Thandwingyi in 2011 will have hopefully found more useful things to do. I am bracing myself for the inevitable night at a flea bag hotel with mosquitoes, bed bugs and/or carpet beetles. I am bracing myself for the inevitable town with no hotel at all, or no licence to host foreigners. Strange skin irritations will come as no surprise. In the Dry Zone cities, I am prepared mentally to have a few unpleasant encounters with raging ethno-nationalists. I will try not to drink too much Myanmar Beer. I will forget to exercise. Loneliness followed by bouts of mild depression will creep up on me. I will photograph lots of old movie theaters. In the end, barring catastrophe, I will be smitten with Myanmar as usual. You can follow me on Instagram and Facebook which I will be updating regularly while on this survey. World War II history buffs, here's one that you might appreciate. Shortly after the Japanese invasion of Burma in 1942, the bucolic little burg of Ye-u in Sagaing Region got caught up in the ravages of war. 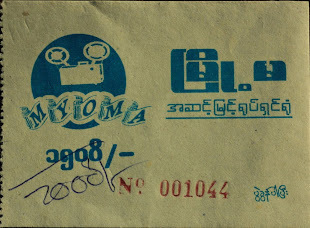 The town's freshly minted Myoma Cinema was commandeered by the occupiers and put to use for nefarious purposes. 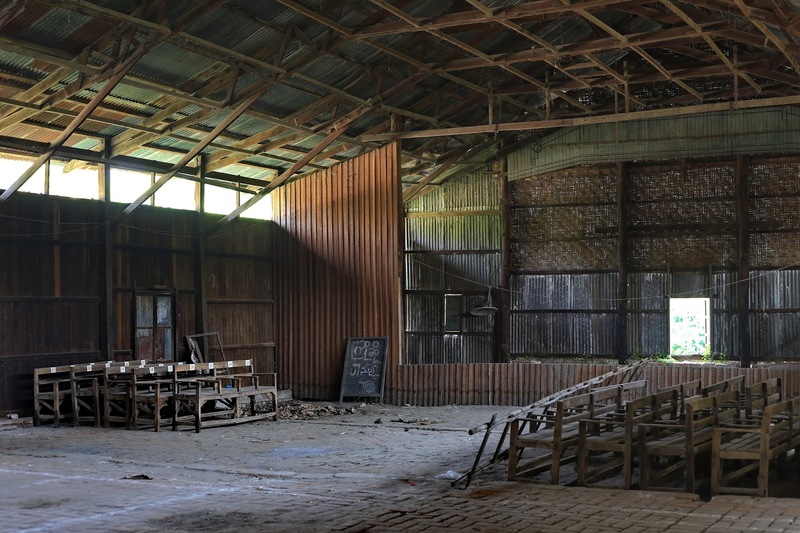 Specifically, a subterranean chamber was built beneath the auditorium, which, according to the current owner, was used as some sort of prison/torture chamber by the Japanese. As far fetched as that may sound, that's what I was told. This unassuming, timber framed cinema hall, with brick nog walls and a gabled roof, more akin to a country cottage than anything else, had a dungeon below it. And it's still there, according to the current owner. 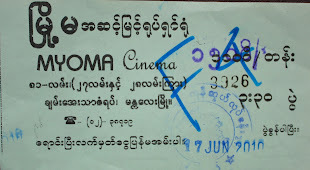 The ever-humble Myoma Cinema, looking very much like a country cottage, holds a dark secret below its floors. Beautiful brick flooring, exposed trusses and tree trunks for structural supports. A Gaumont Kalee 12 projector, dating to 1939, still stands in the Myoma Cinema's wooden projection booth. A portrait on the wall of the projection room depicting the wife of the original owner. 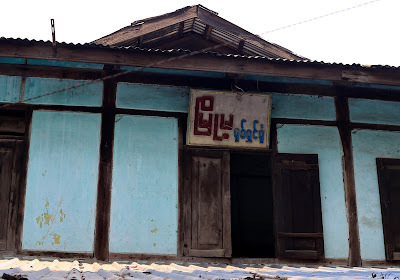 The humble sign board for the Myoma (Central) Cinema hangs unassumingly beneath metal eaves. A cursory search for information on the internet doesn't yield much about any instances of Ye-U in World War II. 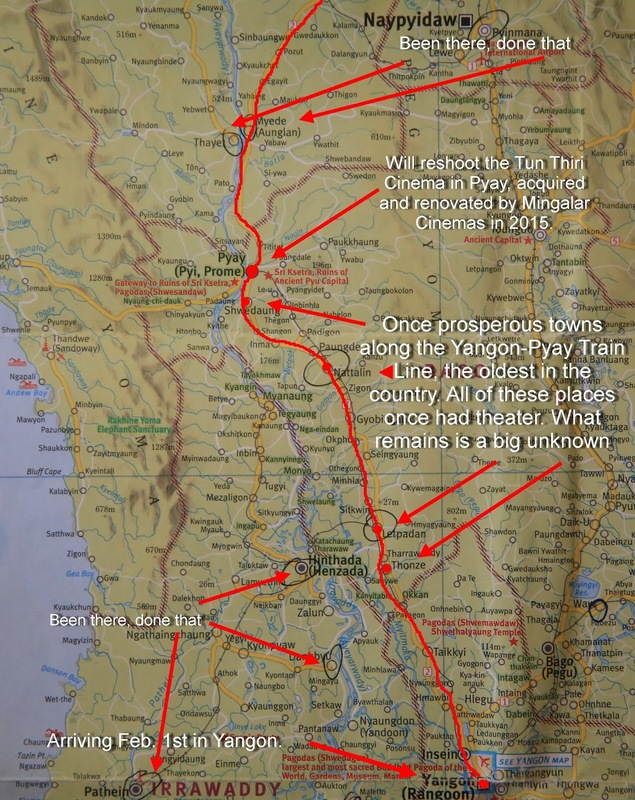 The most significant thing I could find was that it was, and indeed still is, the terminal town of the Mandalay-Ye-U train line, which was bombed during the war. Needless to say there is zero information about a movie theater serving as a torture chamber or prison for the Japanese occupiers. 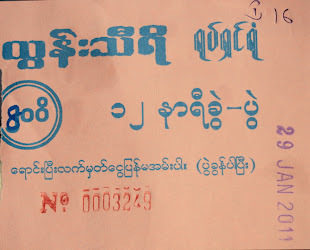 The fact that the current owner of the theater, who was otherwise extremely accommodating, spoke no English, nor I any Burmese, didn't help things. Had communications between us been better I might have gotten access to the alleged chamber below. 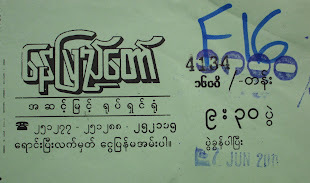 The only way I was able to find out about the nefarious crypt in the first place was to record the woman talking about the theater and then replay it for some bilingual friends when I got back to Yangon. Had I known about it when I was there, you can be sure that I'd have asked for access. Maybe I'll follow up, with a translator, during my upcoming theater survey in February.